The ETP Omni-channel Retail Promotions Planning solution – ETP Accelerator, is developed to help retailers plan, execute, and monitor retail marketing promotions and deploy them quickly accordingly across their various channels online and offline. It is designed with a powerful business rule engine that allows you to visualize a promotion across merchandise, channel, location, time and customer dimensions. ETP Accelerator is equipped with an intuitive dashboard that enables retailers to stay abreast of the customer response to their promotions against various goals and targets set for each promotion. Then tweak their retail marketing promotions as well as easily reactivate previously successful promotions. Merchants and Stores can view their various marketing promotions across various periods in a daily, weekly and monthly calendar format using the in-built promotions planning calendar allowing them to further sync their promotions with the brand’s social media network. The ETP Promotions Planning software also enables you to save promotions and their performance for various seasons or events and review them the next season or event and redeploy them after tweaking them. ETP Accelerator helps you in creating a knowledge based promotions strategy. ETP Accelerator offers the ability for external applications to leverage ETP’s powerful promotions engine using the Promotion as a service feature which is built on Microservices architecture. Any external application can pass order information to ETP Accelerator and in response ETP Accelerator will apply the applicable discounts and send back the updated order. 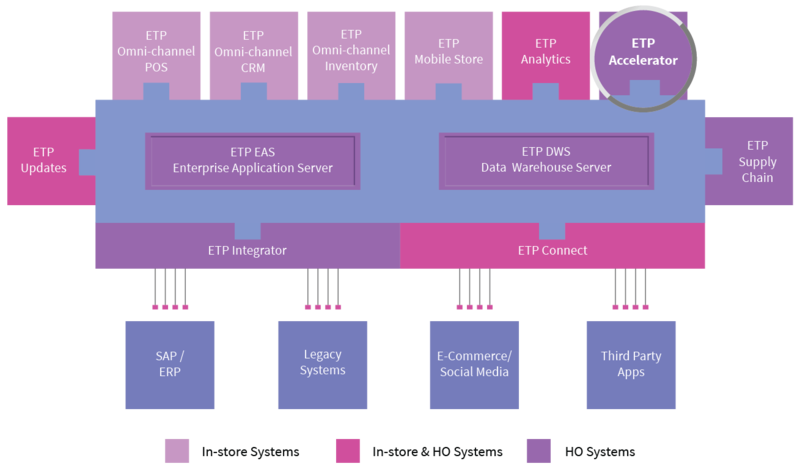 The monitoring and management of this data exchange can be controlled by the ETP Connect application. Both ETP Accelerator and ETP Connect are web based applications enabling easy access by authorized users. External applications can include POS solutions, mobile apps, eCommerce sites or kiosks. These Microservices are built using Java and use Restful services to enable the execution of the promotions such as free item promotions, discounted item promotions, time or customer based promotions, location wise/area specific promotions, and many more.